Nepal is ready for Vijaya Dashami 2016 – it will be huge! If you thought the volume of family travel for the Thanksgiving weekend in the USA was massive, well think again. The trains, planes and roads of South Asia are about to take the strain of over one billion people attempting to make it home to their loved ones for the annual Vijaya Dashami Festival, also called Dashain in Nepal. This year the culmination of the extended festival period falls on October 11th - so the Earth might move a little on its axis that week as millions and millions of people from Sri Lanka, Bangladesh, India, Nepal and Hindu communities across the world make journeys to be with their families. In Nepal this is by far the biggest and most important Hindu festival of the year - and we love a good festival. 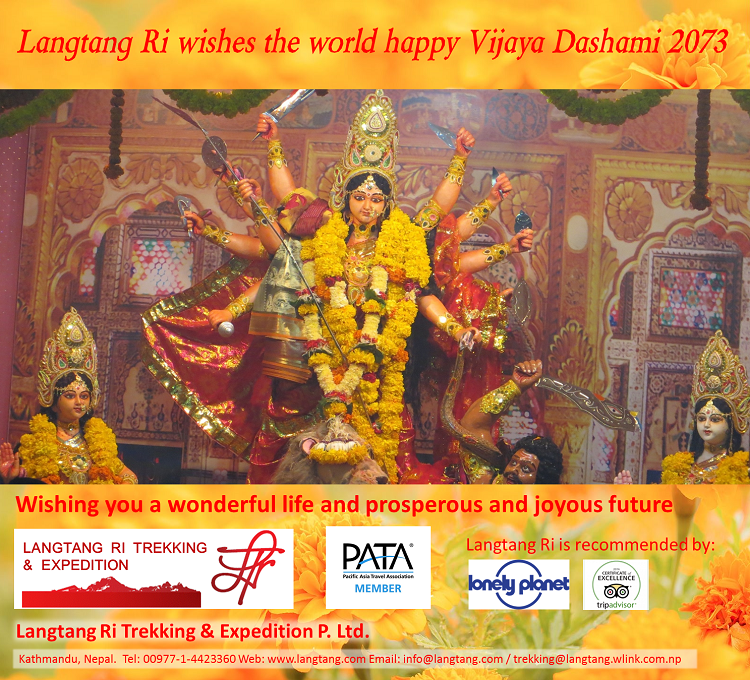 The origins of Vijaya Dashami date to millennia past and mark the day of victory by Durga over the demon Mahishasura. Legend has it that the demigod Mahishasur grew powerful and wreaked havoc on earth and attempted to capture heaven. However the powerful gods Brahma, Vishnu and Shiva would not tolerate such bad behaviour and disrespect. From the mouths of Brahma, Vishnu and Shiva a bolt of lightning and created a young beautiful female virgin with ten hands, goddess Durga. The gods gave her their weapons, and mounted on a lion that assisted her, Durga fought Mahishasur for nine days and nights. On the tenth day Durga was victorious and Mahishasur was killed. The earth and heaven were saved. Such a spectacular achievement deserves a spectacular celebration - and a noisy and colourful Nepali festival too. So October 11th 2016 is a fantastic time to be a visitor in Nepal. Whether you are visiting Kathmandu or trekking high in the Himalaya or on safari in the jungles of Chitwan you are sure to be welcomed into the festivities of the local people. But even if you miss this year’s Vijaya Dashami you can still enjoy the fun and excitement of dozens and dozens of other festivals held in Nepal throughout the year. There is a festival being held somewhere in Nepal every day of the calendar. Come visit Nepal soon and join in the fun. Everyone here would love to see you.